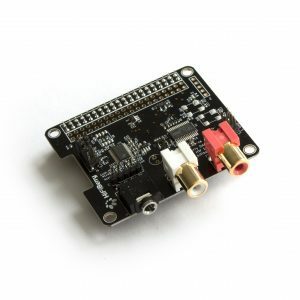 The HiFiBerry DAC+ ADC is a high-resolution digital-to-analog and analog-to-digital converter for the Raspberry Pi (newer models with 40 pin GPIO connector). 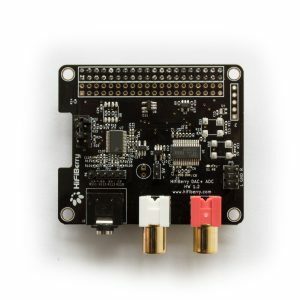 This is a special sound card for the Raspberry Pi, optimized for one specific use case: the best audio playback quality. It is specifically designed for applications that do not only need playback, but also recording functionalities. Hardware volume control for DAC. You can control the output volume using “alsamixer” or any application that supports ALSA mixer controls. Note that the actual board might look a bit different. Layout and components might change without further notice. We do not guarantee a specific PCB layout or specific components. This 5-pin connector can be used to connect a balanced input (e.g. XLR or 6.5mm jacks). Pin 1 is on the left. NOte that the balanced input has to be selected with the jumpers (see below) and will always have a 12db gain. It should not be used with line-level inputs. This connector can be used to connect to external components, e.g. an amplifier. The output is connected in parallel to the RCA jacks. Pin 1 is on the top left. The jumper block is used to configure the input stage. In most cases it is recommended to the the default setting without additional input gain. 32db gain can be used to connect dynamic microphones. Jumpers are numbered from top to the bottom. 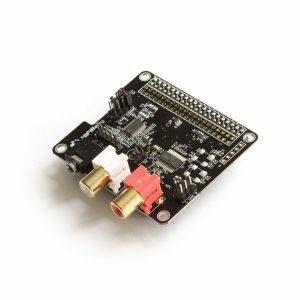 To support the DAC+ ADC, a Raspberry Pi Linux kernel of at least version 4.18.12 is required. Have a look at the documentation how to update the Linux kernel.